Now with more camper shell. What is it, and why? For me, truck beds are really on useful when they are a place where things like gear for at the racetrack doesn’t fly out at 80mph, doesn’t get wet when it rains and is at least slightly less likely to grow legs and walk away in a hotel parking lot. Yet for racing weekends, I’m also perfectly happy to have aromatic things like fuel jugs and a couple of sets of race tires in a separate compartment from me, so camper shells work really well for how I use trucks. Of the six trucks I’ve owned over the years, five had camper shells of various manufacture and one with a soft tonneau cover. I wasn’t a fan of the tonneau cover on the 02 GMC 3500 dually, besides that the price was easy on the wallet. I’ve gotten to experience them from most of the big manufactures at varying price points. If you haven’t purchased a new camper shell before, they are not cheap. Prices run from about $1000 to $3000, depending on how fancy you want and what level of quality you can live with. This would be why you see folks running around with old, mismatched shells that don’t fit the model of truck they currently have. My budget was going to be not more than the mid-point of the new market, and with the intention of keeping this truck for the long-term. This meant that if I wanted fancy ones with flush mounted side windows and curved, one-piece all glass backs, I would have to go with a lesser manufacturer. Likewise, if I wanted to go high-end on quality, I would be looking at a more basic model from a better manufacturer. I’m a happy camper. Functionally, it does exactly what I want it to do. It will keep things locked up and dry. The fit is very good. I’ll have to scale the truck again to see exactly what it weighs, but shells usually weigh around 250lbs. The truck does drive like it has a little bit more weight, but it also smooths out the ride on the rear suspension a little bit. 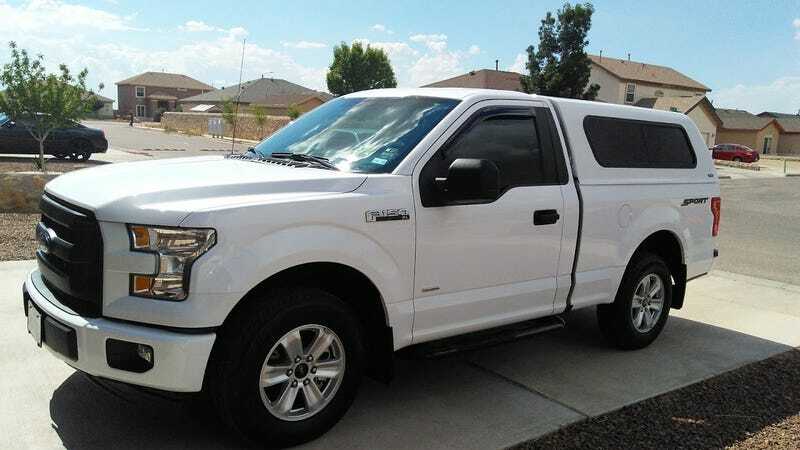 Aerodynamically, early reports over a couple of days commuting indicate that I’m doing right about 1mpg better on the same 80mph highway commute compared with the open truck bed, which would be about what I was expecting and inline with what I’ve seen with other trucks. Aesthetically, I think it looks pretty good for a basic shell, and it really changes the whole look of the truck. There are a few details on the back corners of the shell they didn’t finish as well as I would’ve liked, but overall it seems to be better put together than any I’ve had before. The paint match is pretty good. I already mentioned that the inner fiberglass trimming on the rear corners isn’t quite as good as I would’ve liked. Also, the new paint will badly need a claying and waxing in a month or two. There looks to be a fair amount of road grime from its delivery journey on the finish.